If you are looking to make this deck do its thing more often, I would recommend playing more 1-cost mana creatures like Birds of Paradise . These let you cast your spells a turn earlier which is really good! Even though I really like Sadistic Sacrament , the fact that it costs 3 black mana and doesn't make a direct impact to the battlefield makes it a little bit awkward. I would also play more dual lands like the Blooming Marsh you have so that you can have the right colors of mana more often. I see you have a Hissing Quagmire in the side and it would be fine to just have it in the main board in my opinion. It never hurts to have a full 15-card sideboard, so might as well throw in 3 more random cards to fill it up! If you want ideas on specific options, try putting cards into the sideboard that are really good against some decks but not necessarily very good against others, like ways to exile the graveyard, more ways to destroy enchantments and artifacts, ways to take cards away from your opponent's hand or ways to kill creatures. 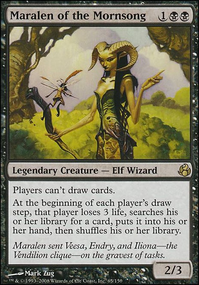 Lastly, since there are many different one-of creatures in the deck, a few copies of Chord of Calling can help you get the ones you need when you need them. Another tactic I’ve seen is being very aggressive, offensive and proactive about it instead of reactive. This however once again relies on How well you know your play groups meta. In all honesty my main group does not see a great deal of GY hate. There is one strong Muldrotha deck and that’s about it. Graveyard love is not a common theme in the group so why should hate be there? However, if the meta sees a lot of GY hate then I really liked these very aggressive gems. Sadistic Sacrament , Bitter Ordeal , Nightmare Incursion . I totally forgot that Vona's Hunger existed! :)) I'll have to watch how quickly I can get to 10 permanents. I think I can try running Dismember; the -5/-5 is significant, compared to Sickening Shoal which might end up becoming a pitched Last Gasp most of the time. That one mana to pay can be a steep cost on when the game is down to the wire, but it lets me hit Atraxa, Edgar, and the like. As for Extraplanar Lens, I'm actually going back and forth with it and Crypt Ghast, hence I haven't unsleeved my Snow-Covered Swamp. Extraplanar Lens gets me two-for-oned in my meta, even when I use it as a Bubbling Muck. I also have trouble making the most out of it because I run a lot of nonbasic lands. Crypt Ghast dies to the Pox effects and other removal spells but it gives me Extort and at least I don't lose a land when they respond to it. I used to run Nirkana Revenant too, along with Caged Sun but it was too high on the curve, so they got cut out. I do want to run Contamination so that I have 2 functional copies of Infernal Darkness, but I don't have the creature support for it. 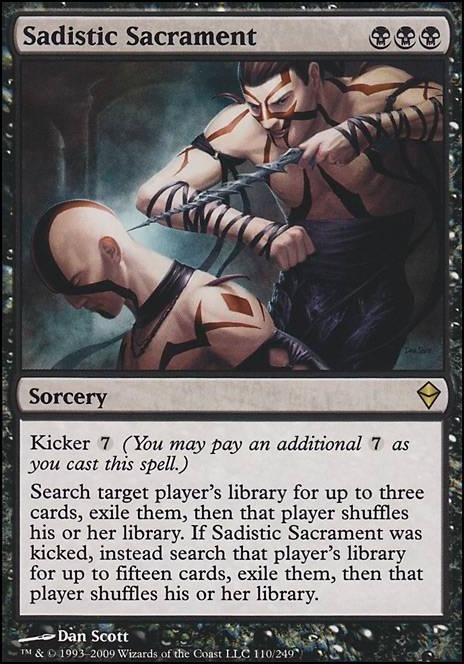 Sadistic Sacrament was once part of the deck, but I ended up being able to regularly pay for the Kicker cost, which made me rather unpopular. I switched to Praetor's Grasp and added multicolor mana rocks so it can also act as an "off-color" tutor. However, I do still bring it out when I'm playing in a cutthroat environment. I would also recommend a little bit more ramp. Land ramp is better in the long run, but slower. While artifact ramp is faster but more prone to being destroyed. Some card suggestions that may help. Extraplanar Lens, Nirkana Revenant, Sadistic Sacrament, Vona's Hunger, Dismember, Contamination. Love the deck idea and build. +1 Just for that. Here might be some card suggestion for interactions that you may find helpful. Wear / Tear - Has been a staple card in my card choices whenever a R/W deck is involved. Sudden Spoiling - Tech card that has been a lifesaver in multiple occasions. Especially in making hexproof creatures target-able. 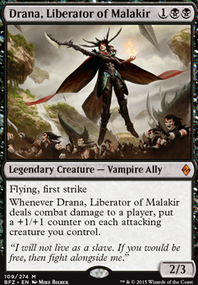 Vona's Hunger - Same as above, but has multiple uses in disrupting board state. Mindblade Render - A combat oriented Dark Confidant. Twilight Prophet - Unsure if this might fit your bill, but it does help with card draw with no downsides but revealing your cards. Sadistic Sacrament - Quite an evil card and does interact. Silence - Can really stop people, when they are going for a big turn. Cast on their upkeep. Hope that helps, but definitely an interesting list! To be honest, you can actually cut Infernal Darkness, and no you are not 'forced' to use the other enchantments or creatures. Sundial is just bad in this type of deck and can be cut immediately. What a combo is when you use two cards that synergize to get a result that more than what the cards itself can do. 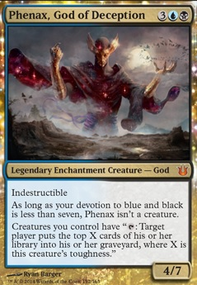 An infinite combo is when two cards are used in conjunction to produce an effect that can loop itself thus repeating the result infinite times. Contamination and Sundial has no synergy together, it essentially locks you down as well since your ending your turn and not allowing yourself to do any more interaction, you have to be able to break parity when you play cards. Ophiomancer is great and I would add that in. Same thing how Painful Quandary can work while taxing them. 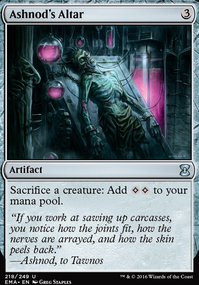 Additionally you would use cards like Mindtwist, Sudden Spoiling, Plaguecrafter, Mutilate, Syphon Mind, Persecute, Ob Nixilis, Unshackled, Praetor's Grasp, Sadistic Sacrament.